I did this super fast manicure a few weeks ago. I was putting Wet n Wild's Buffy The Violet Slayer on for the third consecutive time when I noticed my bottle of Nicole Step To The Beat of my ♥ sitting on the table. Perfect combination. Purple hearts with purple polish! Of course, this isn't a color accurate representation of Buffy... But it still looks pretty, right? You can see little circles of topcoat around the hearts, haha! The polish is still wet in these pictures. I put extra topcoat on top of the hearts to make them a little more smooth, otherwise I keep playing with them and sometimes peel them off. 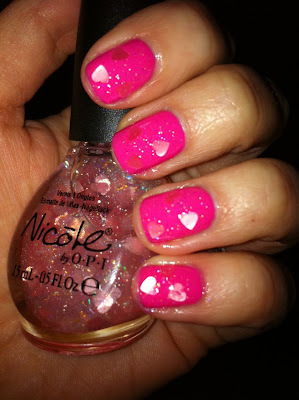 This is Nicole's manicure, which is done with Zoya Jolene and Nicole by OPI Love Your Life. Fitting, right? Nicole wearing Nicole! She did a way better job with her hearts than I did with mine. This looks so pretty. I love the hot pink with the light pink hearts! And her mom goes one step further and literally turns her nails into hearts! The color is Sinful Dream On, a neon purple. I love this so much. Heart shaped nails. I totally want to try this! This time of year makes me all silly. I find myself wanting to be surrounded by red flowers and heart shaped lace doilies and pink sugar sprinkles... The actual Valentine's Day is rarely special for me, but I love the season and everything that goes along with it. All the pretty and almost sickeningly cute decorations and candies are a welcome break from the dreary, seemingly endless snow and cold during the last stretch of winter. You know what I'm talking about. That depressing period between the end of the Christmas season, after all the lights and decorations are gone and there's nothing but frigid cold, bare trees and absurd heating bills and that first warm day of spring when you can actually go outside without your hair freezing. As much as I do love winter, after a while, the oppressive cold and lack of color starts to get to me. I need that little bit of color and cuteness in February. those heart nails are insane!!! Your manicure is so sweet. Those heart shaped nails are insane! Love them both. I agree with you about the Winter and Valentine's Day. Some nice pink and red color is very welcomed. all three are super cute! and i agree about the valentine's day season. i love the red,white, and pink! Omg, the heart shaped nails is so creative! I wish I could be so cutesy as to invest in Step to the Beat of My <3. I just can't do it! Too cute! Too girly! It's just not me! Looks great in these manicures, though. I must say, i feel the same about Valentine's....I was telling my boyfriend that I love Valentine's. I especially love all of the "beauty" things that come out for V-day. Take, for instance, the PS bronzers and blushes. I love those! That Sinful neon purple is cute! I never thought I'd want neon polishes, but I tried my first one, and I love it! Those heart shaped nails are cute! I'm loving that violet polish. It's beautiful. I have to agree with Antonia! Valentines Day is so special to me! oh my gosh, the heart shaped nails are so creative! The heart nails are A. Mazing. Hats off to Nicole's mom! i love the second one. its so cute. i haven't bought Nicole polish in soo long.